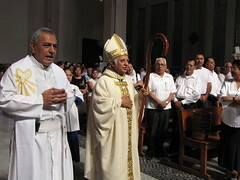 Bishop Miguel Patiño Velazquez of Apatzingán, Michoacán, enters Mass on April 1. The Mexican bishops' conference acknowledged last week that Catholic priests have suffered threats of violence and extortion at the hands of narcotics trafficking cartels and organized crime. The acknowledgment ended a stream of conflicting messages from various church officials on a delicate subject that many in the church seem uncertain of how to handle. The bishops said in an April 15 message at the end of their spring planning session that an increasing number of prelates in areas rife with drug activities had been moved to other parishes and other parts of the country or assigned other pastoral duties. Their acknowledgment comes as the Mexican government revised its death toll figures upward in the ongoing crackdown on the cartels to at least 22,700 since December 2006, when President Felipe Calderón took office. Their acknowledgment also comes as Mexico's evangelicals have gone public with their own travails with extortion and threats. Evangelical leaders told the newspaper Reforma early this month that at least one pastor had been kidnapped and that extortion has taken place at many places of worship and even at their charity projects. Catholic officials had been reticent to acknowledge the threats against prelates and had been somewhat late in developing a comprehensive response to the issue of violence in Mexico. Church observers say Catholic officials prefer to follow the government's lead on such issues and desperately wanted to avoid running afoul of the cartels, who have become the de facto authorities in some parts of Mexico. In early April, a spokesmen for the bishops' conference, in comments published by Reforma, denied that there had been any threats against Catholic prelates. Catholic leaders in troubled dioceses and archdiocese such as Durango, Acapulco, Morelia, Tacambaro and Apatzingan all told me last year there had been no threats against priests. Last summer, a spokesman for the Archdiocese of Mexico City told reporters that priests had been threatened in the state of Michoacán - drawing a swift denial from the Catholic hierarchy in that region. A few priests would occasionally break with the official line in their dioceses, however. Father Alfredo Gallegos Lara - a gun-totting, rachero ballad-singing priest in Michoacán, better known as "Padre Pistolas" - told the news agency Quadratin that a fellow priest had been threatened and that he himself had been robbed. He also encoured his parishioners to keep arms in the homes - something permitted by the Mexican constitution. The church's relations with the cartels is another touchy issue: Catholic officials deny that they accept donations from cartel leaders, although the bishops' conference president, Archbishop Carlos Aguiar Retes of Tlalnepantla, acknowledged: The cartels have been generous in various parts of Mexico by donating funds for infrastructure projects. Others in the church said the cartels' money was not welcome. One bishop in southern Chihuahua declared in late 2008 that no priest in his diocese would perform funerals for "narcos," but a church spokesman in the state later said the move proved unpopular. Past comments and actions on the issue have been contradictory, however. The late bishop of Aguascalientes caused a scandal in 2005, when he said the church receives money from the cartels and could put the illicit funds to good use. His comments were quickly disavowed.